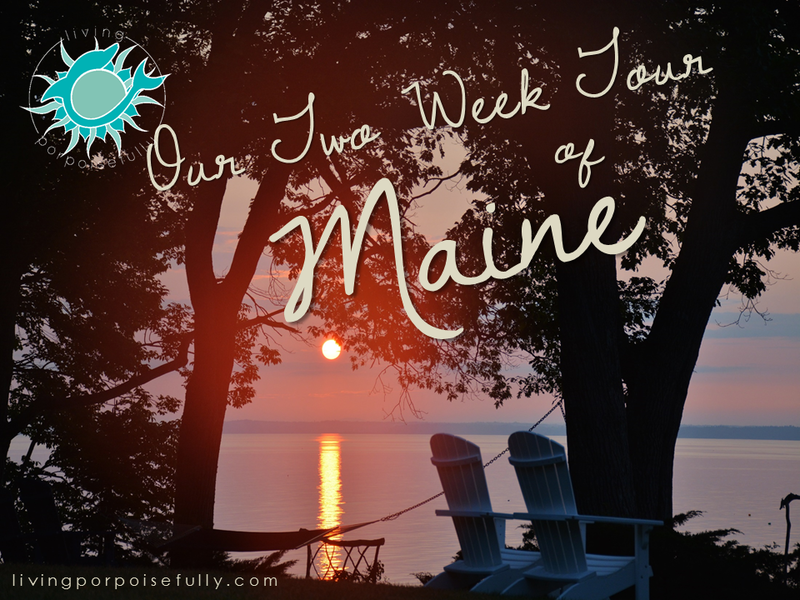 Get ready for a fun adventure and the temptation to plan your own trip to Maine! Before we left for Maine this summer, our friends and family were asking, “What are you going to do for TWO WEEKS in Maine?” They were baffled that we would spend that much time in Maine. Well, the two weeks was a fantastic amount of time (we’d spend the whole summer there if we could!). It was an incredible combination of connecting with nature (our favorite), eating phenomenal food (definitely a must), and relaxing too (always important). We started in Camden, a picturesque coastal town with a rocky coast and simply charming New England style scenery. What we loved: We enjoyed the pristine ocean views of the inn we stayed at, and a busy-but-relaxed hub of downtown with several places to feast on fresh (and sustainable!) seafood. The Maine-made blueberry soda was an intensely refreshing experience! We also took a 2 mile hike one day in Camden Hills State Park that really got our blood pumping. The view at the top that overlooks the bay was worth it, and we were proud that we made it despite the inclines that were much steeper than we’re used to! From Camden, we moseyed on to Bar Harbor, which was a little more populated but still a relaxed and lively coastal atmosphere. What we loved: Bar Harbor really has it all: the conveniences of the town, and is right next to Acadia National Park’s main entrance for all of your hiking and nature-seeking desires. The hotel-style lodging was quaint in its Tudor 3-story build but had all the amenities you could want. We were smitten with Bar Harbor in that there was so much to explore and take in, so we were glad to have made this the place we stayed the longest at. We took an excursion inland for a stay at Moosehead Lake, and were graced with scenic views of mirrored land- and skyscapes, coveted sightings of wildlife, and gravel roads lined with trees. What we loved: We went on an incredible moose tour in a canoe, and were lucky enough to witness SIX moose, a bear, a bald eagle, and a pair of loons with their newly hatched chick. We had the best tour guide, who clearly loves what he does and expertly shared his neck of the woods with us! Our stay at The Lodge at Moosehead Lake was phenomenal – the innkeepers were so warm and welcoming, the views were breathtaking, the rustic-chic room exceeded every last creature comfort desire, and the campfire dinner with lobster, steak, and gourmet s’mores was the ultimate feast! While we were in town, we also went on an exhilarating whitewater rafting trip. We finished up our trip with the leisurely active Boothbay Harbor. What we loved: Boothbay Harbor had a cozy harbor vibe, and it offered plenty of leisurely activities for us. After having been more active in our earlier stops in Maine (hiking, nature tours, etc. ), it was a nice way to end the trip on a more leisurely yet still active note. P.S. – We couldn’t get enough of Maine, so we made a couple DIY crafts to remember our trip. Check them out! Thank you Molly! The scenery there is just incredible and very photogenic!